by Seiko Instruments Austin, Inc. Manufacturer: Seiko Instruments Austin, Inc. The Seiko Instruments InkLink handwriting system is the ultimate tool for instantly capturing your handwriting or drawings directly to your handheld, laptop, or desktop PC. It's easy to use, works on ordinary paper up to legal size, and easily clips onto 50-page tablets. Plus InkLink comes with its own carrying case that fits in a pocket or purse. Using Seiko's exclusive binaural technology, the InkLink Data Clip continuously listens for communications from the InkLink pen while it tracks the natural movement of your hand. As you write anywhere on the paper pad with the InkLink pen, the InkLink Data Clip reads precisely the location of the pen tip and communicates its exact position to your handheld, laptop, or desktop PC. I have both InkLink and SmartPad II.I thought I'd get more use out of the InkLink since it has both PDA and PC interface; however, as stated in many of the reviews, it's a hassle to setup and has many weak s/w issues.Additionally, I take great issue with the extremely short pen battery life. SmartPad II is not easy to use with a laptop; however, it works like a charm with my Pocket PC.Plus there is no setup hassle and the battery life is wonderful...I've not has to buy a replacement battery yet.It's an odd "AAAA" (that's right, 4 "A") battery.The organizer case forced me to lighten up as it does not contain the usual ring binders; however, there a lot of surface on the left inside face to Velcro till your hearts content.Finally, this device does not optically sense the location of the pen; so, there are no issues with flipping sheets.I've modified a standard steno pad (by trimming the backboard with a scissor) to fit the sleep) and find I can flip back and forth and edit as long as I do the same on the PDA. 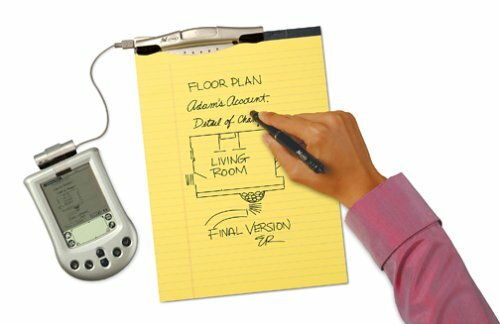 I realize that you could fax or scan hand scribbled notes and have a graphical capture anywhere.I find that I can draw and beam diagrams to those that have PDAs and email them to those that do not without another digitizing session.So, chose the SmartPad as your InkLink will sit and collect dust...mine does. Disappointed in Seiko, disappointed I bought it. I tried the Logitech Digital IO pen and didn't like the size and fact I had to buy expensive proprietary paper -- so I bought the Seiko. Problem with so many hardware manufactures is that they just don't know how to write (or care) about the support software. 1. When using the pen with a PC, if something takes to 'focus' from the Seiko software, like a popups message or alert, the pen will stop recording penstrokes. This can be a disaster if you are not constantly watching your PC screen. 2. When using the pen with a PDA if you loose the ir link or the PDA popups message or alert, the pen will stop recording penstrokes. Again, this can be a disaster to your notes. The only way to get what you've written into the file is to painstakingly write over the parts you have already written. 3. Better have a lot of little hearing aid batteries handy for that pen -- it chomps through them. I bought the pen at full price when it first came out. I complained to Seiko about the lame software and they said a number of people had the same complaint but there was a development kit available and that they would constantly be improving the software. It's been two years now and Seiko has not released a single update. I recommend not buying this pen. While the hardware is nice, the software is basically useless, unless you are willing to put up with a lot of headaches! The InkLink system consists of a clip that fits on the top of an ordinary writing pad, and a special pen.The clip connects either to the USB port of a desktop computer, or to a little gadget (supplied) that allows an IR connection to a palm or pocket PC. The device is very good at what it does---digitising drawings and handwriting at extremely high resolution.I tried writing as small as I could on the pad, and it's still very good on-screen.The resolution's basically greater by the width of the ball-point pen. The hardware is amazing, and works like this:the clip sends an infrared pulse to the pen, which then emits an ultrasonic pulse back.Two detectors on each end of the clip pick up the ultrasonic pulse, and knowing the speed of sound, calculate the exact position of the pen.It works perfectly, even right at the far edge of a letter-sized pad. My main qualm is with the software.It's clunky and has no default vector export format.It took me a long time to work out how to export the drawings in a vector format (the supplied software allows export as .bmp, .jpg, and .png, all bitmat formats).To export in a vector format you have to print the page to a pdf file (using pdfwriter as a virtual printer), then import the pdf into a drawing program such as Adobe Illustrator.It would be really nice to be able to use this device directly in a drawing program, as an adjunct to the mouse. Overall, I would recommend the Inklink.It's very good at what it does, and once the vector export is worked out, it works well as a vector input device.It's also amazing to write on an ordinary pad, and see the same marks come up on the screen.If only Seiko would put a bit of effort to the software, this could become a must-have device. Wonderful device -- but where is Linux support? It is a wonderful device -- but why doesn't it support Linux? This makes it useless for many people, notably all those with the Sharp Zaurus handhelds. It's a shame, as the InkLink would be an ideal companion to the Zaurus C-760. This product does everything advertised.I just wish it came with functional recognition software.It's not enough to be able to e-mail jpgs of my notes to someone else; I need my notes reliably converted into text. As another reviewer so eloquently put it, this is nothing that can't be accomplished with a crayon and a scanner. The "Ooh and Ahh" factor of watching one's handwriting pop up on the screen isn't worth $. Whether you're brainstorming with your team, presenting complex ideas, or instructing a class through distance learning, the Mimio Digital Meeting Assistant whiteboard scanner is a valuable timesaving tool that adds clarity to all your presentations while saving your work as you go. Electronic whiteboards free meeting participants of the distracting and time-consuming task of note taking by combining a touch-sensitive writing surface with a scanner and a thermal printer. With the Mimio Digital Meeting Assistant, anything written or drawn on the board surface can be scanned and printed, allowing the participants to remain focused on and engage in the topic at hand. Mount the Mimio Digital Meeting Assistant capture bar on any whiteboard up to 4 by 8 feet to record the notes and thinking processes of lessons and meetings on to your computer. Used with your PC, the easy-to-use software displays the basic commands on the screen. All your work is recorded sequentially, so you can save information, then wipe the board clean to proceed to your next thoughts. Easily fastened with either lever-action suction cups or permanent mounting brackets, the bar attaches vertically to a wide board or horizontally on a portrait-size whiteboard. The capture bar has five command buttons, making quick work of tasks like starting a new board, tagging a board for later reference, printing, maximizing a board, or activating the Mimio control panel. Once the information is preserved on the computer, the images can be printed, faxed, or e-mailed. Good But You have to write big. The Mimio whiteboard scanner was very easy to setup and get running. I was really surprised with how easy it was to use. When you get the product be sure to go check out the Mimio web site for software updates. The only problem I have is that you have to write kind-of big to make it legiable on the computer screen and some times if you not writing hard enough it doesn't pick up.But overall this is a very good product. Mimio Digital Whiteboard is Great! We attached a Mimio Digital Whiteboard to Sorenson's EnVision desktopvideo conferencing product. The whiteboard played flawlessly withSorenson's electronic whiteboard application which is based uponNetMeeting. With a PC, Sorenson EnVision and Mimio, you have a powerfulremote teaching and collaboration platform!